Buying the best pocket knife is an act that can only be completed once you have given serious consideration to the situations in which you will use the knife. 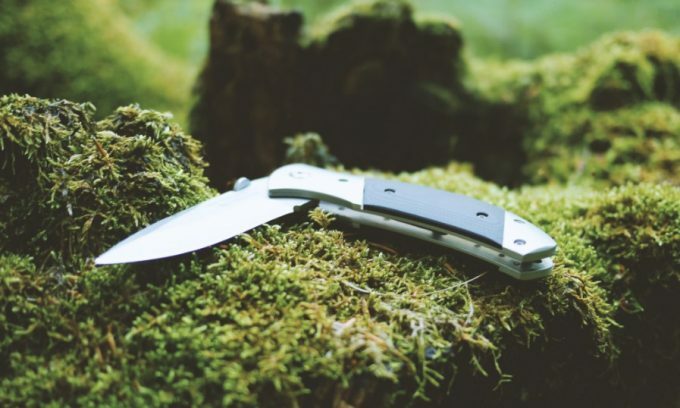 There are many knives on the market, some of which are more suitable for everyday, general use, while others are ideal when you are camping, fishing, hiking, or engaging in some outdoor adventure. 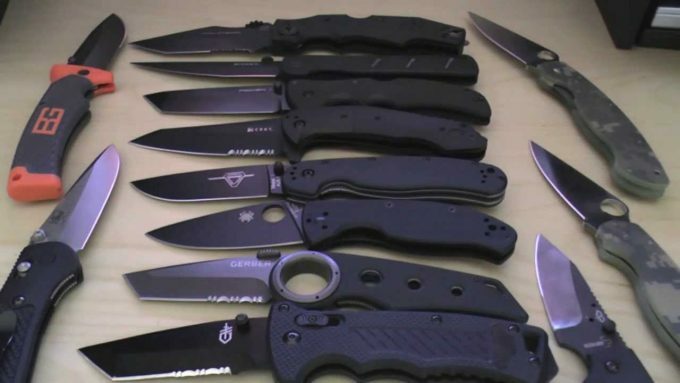 Knife manufacturer also makes pocket knives that can prove particularly beneficial in survival situations as well: These units are typically crafted, with law enforcement officers or members of the military in mind. Whatever your situational knife needs might be, you still have much to consider before making an initial investment in a high-quality pocket knife. 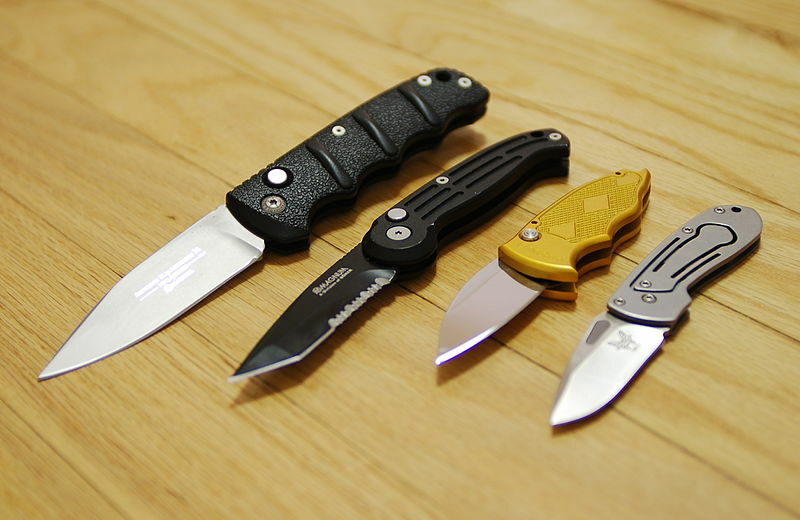 There are about five important things to consider when it comes to buying a pocket knife. The five essential considerations include the level of resistance to corrosion a blade offers; the blade’s ability to retain an edge; the hardness of the blade’s metal; a blade’s toughness or durability defines its ability to withstand damage, and a knife blade’s ability to resist natural wear and tear from exposure to friction when cutting. The material used in producing a pocket knife is extremely essential. If you buy a pocket knife produced with aluminum you do not expect it to perform better than a pocket knife that is made with stainless steel do you? The best material for pocket knives is stainless steel. So, if you are looking to purchase a pocket knife, make sure it is made with stainless steel. Furthermore, the knives are made with different grades of metal. The kind of metal a knife is made with will help in determining the knife’s best use, sturdiness, durability, and potential longevity. The goal of having high-grade metals in a pocket knife’s design is so the blade will retain a sharp edge longer and over the course of regular use; so the knife remains resistant to corrosion, and the blade should be easy to keep sharp with just the occasional sharpening session. Thus, harder types of steel are desirable as they allow for a sharpened edge to be retained for longer periods. What is nice about harder steel is that the metal is also often resistant to wear and corrosion, but it can be harder for you to sharpen the blade when necessary. Likewise, if the metal is a softer grade you can sharpen it easy enough, but the edge retention will not last as well as a harder metal will; nevertheless, you can still gain from the corrosion resistant properties. There are several grades of stainless steel. Most blades are made of stainless steel, an alloy that resists rust and corrosion. Three popular examples of stainless steel used for knife blades include 154CM, 420HC, and S30V grades. With the 154CM grade, you get a solid edge and a harder metal because additional carbon has been added to the metal alloy. The 420HC metal grade is another popular option as it resists wear and corrosion and allows you to easily sharpen the knife while promising excellent edge retention. Alternatively, some blades are made out of a premium grade metal like S30V: The “V” stands for “vanadium,” special carbide that resists rust thereby leading to the corrosion resistant properties of the metal while simultaneously offering superb retention of a knife blade’s edge. 1095 Carbon Steel grade is commonly used for machetes and knives; this metal is simple to sharpen repeatedly, and the metal can form an extremely sharp edge. However, 1095 is low in chromium, so this makes the metal more susceptible to corrosion and wear. If you are looking for a tough blade you will need to carefully consider whether you want one of the knives made of the chromium added carbon steel blades; the MOV, CTS, VG, AUS, 154CM, and 400-grade metals. The latter metals are great for longevity in terms of corrosion resistance, but are less tough than those blades containing no chromium. Anodized Aluminum/Stainless Steel: These metals give you a solid handle, but will likely require some additional traction so your hand does not slip off the smooth metal designs. In terms of metals, you can choose from several types including Titanium, Aluminum, and stainless steel alloys. Plastic: Water resistant properties are a given with plastic materials and the handles are inexpensive, but without traction or special designs for slip prevention, the handles can be more difficult to deal with when the knife is in use. Rubber: This material is great in terms of slip-free design and water resistance, but lacks in the longevity factor as it can wear out rather quickly. Synthetic handles are available that are made of materials like carbon fiber, Micarta, Garolite-10 (G-10), and FRN/Zytel. G-10 is one of the most popular handle materials available. Wood: Attractive visually and wood variants give you a solid handle. Wood is prone to water staining and damage over the course of time. Along with wood, there are handles made out of natural materials like bone, mother of pearl, and leather. The size of a pocket knife is very important going forward. A good pocket knife should not be too long or large in size. Instead, it should be of normal length and not too big. 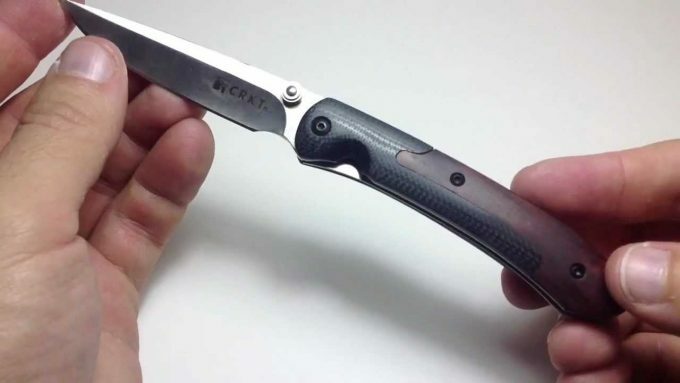 It should be able to fit into your pocket, which is why it is called a pocket knife. A pocket knife must be very light in weight. A good pocket knife must be lightweight but not losing its quality. The knife should not be heavy so as for it to be easy to wield in a time of use. If a pocket knife is heavy, the person using it might find it very difficult to use the knife as time goes on. With a few basic features in mind, including the situational use of the knife, you plan to buy, and what metal blade you want to weld to what type of handle, you already have a good idea about the knife that will best serve your needs. Here are some of the leading knives on the market today, all of which serve well in various situations. 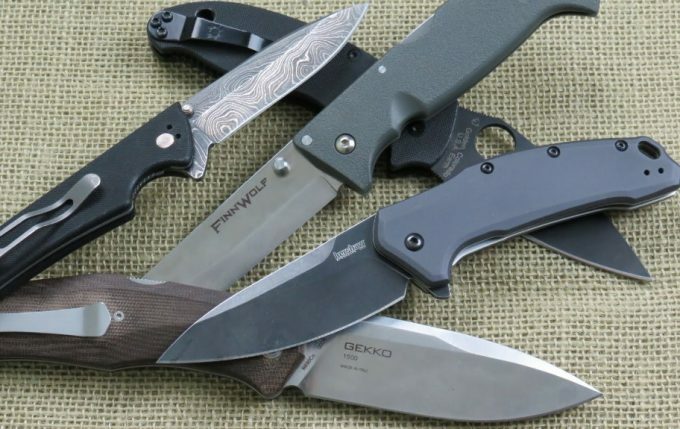 The price ranges of the knives reviewed here span the range of entry price to high end, so there is something to suit every situation, preference, and budget. Specific features: Body screwed together; G-10 knife handle; CPM S35VN steel knife blade; the textured design on the handle; jumped finger coil and ergonomic design. Best use: Survival, hunting, fishing, outdoor, repair, and do-it-yourself activities. 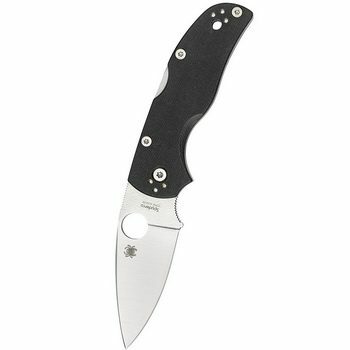 Description: The Spyderco C41GP5 Plain Edge Knife costs around $130 and is a lightweight adaptation of the Spyderco Native, only this time, the manufacturer gives the knife a durable, dependable, powerful, yet sleek G-10 design. The G-10 a handle features a tightly lined texture for a full, easy, safe grip whenever you are using the weapon. To ensure blade longevity, Spyderco gives the C41GP5 Native 5 foldable knife a blade made of nitrogen-hardened CPM S35VM Steel: A metal outdoor enthusiasts and survivalists have come to appreciate for its strength and dependability. The folding mechanism in the Native 5 serves a smooth, fluid operation, and the knife comes with a built-in locking mechanism promises the user no accidental folding that might otherwise lead to undesirable injuries. A four-way clip on the handle makes it easy to clip the Native5 to your belt. Related: If you think this is the right pocket knife for you, then are going to need this Spyderco 204MF Tri-Angle Sharpmaker to make the blade of your knife very sharp again. Specific features: Fire-safe pin; thumb stud release; automatic, dual stainless steel liner locks; black oxide finish; 8CR14Mov metal blade; four finger grooves; textured aluminum handles; assisted opening; an automated locking mechanism; lanyard hole; and a tip up or tip down clip. 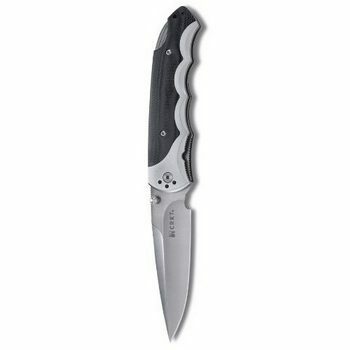 Description: With the Columbia River Fire Spark 1050 Razor Edge Knife, you are getting an affordable folding knife at a price of around $50. The blade of the knife is a spear point design crafted out of 8Cr14Mov metal to ensure blade longevity, resistance to corrosion, strength, and edge retention. The blade has a razor sharp edge, a large lanyard so you can double loop it if so desired, and the knife has automated locking feature to ensure your safety when in use. The entire weapon is black and the blade has a black oxide finish to ensure non-glare, non-reflective properties. The handle is equally durable as the manufacturer makes it out of CNC machined aluminum materials and sports a G-10 texturized scale design for greater grip and control. Four finger grooves lend to the ergonomic fashioning of the Columbia River Fire Spark. The knife has assisted opening feature, making the weapon open fluidly and with great ease. The company that makes the knife promising a reliable, safe, and dependable performance from this attractive pocket knife selection. Related: We recommend you buy this lubricant Sentry 91060 TUF-GLIDE solutions if this is the knife you decide to choose as it will protect the knife from rust, friction and wear. Specific features: Steel S30V blade; G-10 texturised handle; tip up, tip down, left or right quad mount clip, and a Tungsten DLC BlackWash finish. The Speedsafe Assist opening system is included. It comes with a lifetime warranty. Best use: Everyday use, small repairs, do-it-yourself projects. 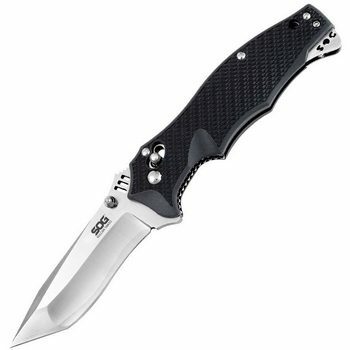 Description: The Zero Tolerance 0350BW Folder Knife hosts a price of around $140.00. The knife USA made, and it has a blade made out of S30V steel lending to its strength. The choice of metal for the blade makes the knife resistant to corrosion and wear. The Zero Tolerance knife is one of the most popular the company manufactures. The weapon has the non-glare, non-reflective Tungsten DLC Blackwash: This same feature makes the weapon have a sleek, well-worn, well-used to implement. The same coating helps in hiding small scratches and minimizing friction on the blade. The Speedsafe Opening system is a patented system that helps the user achieve speedy blade deployment. The exceptional blade design is then married to a G-10 handle sporting a textured design for the very best result in getting a firm grip. The four-way mount system allows you to mount a pocket clip on the left or right, tip up or tip down as desired. Related: If you like this pocket knife and you decide to buy it, we recommend getting this Lansky 3289 Grit Sharpener to keep your knife blade severely sharp. Specific features: Handle color available in olive drab, digital camo, or black. The handle of the weapon is made of G-10 steel. The blade is made of VG-10. RC 59-60 grade steel. The unit is sold with a deep pocket, ambidextrous clip and carry sheath. The knife has liner lock features. Description: The Al Mar S2K SERE 2000 Knife sports a high-end price tag of around $220. The liner locking features in this weapon has a side-spring lock you can close and open with a single hand. This particular knife was an adaptation of the knives developed in the 1980s by Colonel Nick Rowe Al Mar. The adaptation of the original design has lead to a sleeker, stronger, more durable knife offering. This weapon is available in two different finishes: Either matte black or VG-10, both of which include a ceramic coating to minimize potential scratches, make the knife much more durable, and to improve corrosion resistance, which is very important if you plan on using this knife for many years to come. The strong blade is married to an equally durable G-10 handle. The clip is reversible, so you can carry the weapon in the most convenient way possible without risking to get yourself hurt during walking or driving. Related: We highly commend you to purchase this lubricant Liquid Bearings 3UE4M4 Synthetic Oil , if this is the knife you decide on as it will keep the knife from rust and wear. Specific features: A G-10 handle; Aerospace Grade Titanium; 154 CM grade steel blade; patented design; wave shaped opening. Best use: This knife’s weight makes it ideal for survival usage and not so much for daily use. 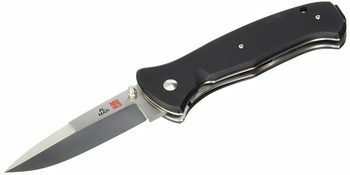 Description: The Emerson Commander Plain Folding Knife is priced at around $230. The knife lock is made of Aerospace grade Titanium to ensure its longevity and sturdiness. With the Emerson CQC-15, you get a Black G-10 handle made of a mix of epoxy and glass laminate materials which are great for having a safe, firm grip, and great comfort while holding the knife. The blade is made of 154 CM grade metal: This material is among the higher grades you can get so you can rest assured in knowing you have a hearty knife with superior edge retention properties. This weapon features a patented design as it hosts the Emerson Remote Pocket Opener or Wave-Shaped Opening, so that if you are in a situation where you need access to the blade quickly, you can get it open with one hand in just a matter of split seconds. Related: We recommend you get this Fury Tactical FP15535 Pocket Knife Pouch if you think this is the right pocket knife for you as it protects you from unwanted injuries. Specific features: Blade made of San Mai VG10 steel; Arc-lock mechanism; double thumb studs hosting ambidextrous slots; Tanto shaped blade; one hand operation; satin finish; Nylon reinforced glass handle; and it comes with a limited lifetime warranty. Sold with a pocket clip for carrying. Best use: Hunting, fishing, outdoor adventure, everyday use, and repairs. Description: The SOG VL-03 Folding Knife sports a price tag of around $160, which is not low, but considering what it offers, it is worth the price tag. The blade of the knife is made of VG10 steel is, with the “G” signifying “gold standard,” thus, you are getting a blade of superior grade. The arc-lock mechanism in the device contributes to the durability of the unit, its strength, and adds to its safety, but it also makes it easy to operate the opening mechanism with one hand. The thumb studs have slots, making them usable with both hands, and the Tanto shaped blade is perfectly suited for survival, hunting, and camping needs. The Satin finish gives the unit a professional look, and the nylon reinforced glass handle is strong and sturdy, meaning that you will be able to use it in any types of conditions for many years, as long as you take care of it properly. Related: We recommend getting this knife sheath Case 00980 Trapper Sheath if you think this is the right pocket knife for you as it protects you from unwanted injuries. Specific features: The set comes with the knife blade along with 31 additional tools. Lifetime warranty covers defects. Tools are made of stainless steel materials. 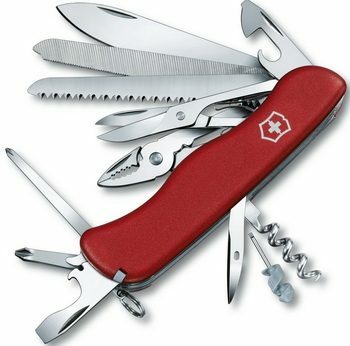 Description: The Victorinox 53761 Pocket Knife sports a price of $70. This knife and multi-tools come with a single large knife blade. It is also equipped with all of the following: A reamer, wire stripper, large screwdriver, bottle opener, small screwdriver for use of Phillips screws, can opener, a sewing eye,a patented mini-screwdriver, a straight pin, and a pressurized ballpoint pen. As you can see, this is not just a knife, but actually a real survival tool for any type of situations. The users who bought this knife claim that it is pretty small and light considering the additional tools it comes with. 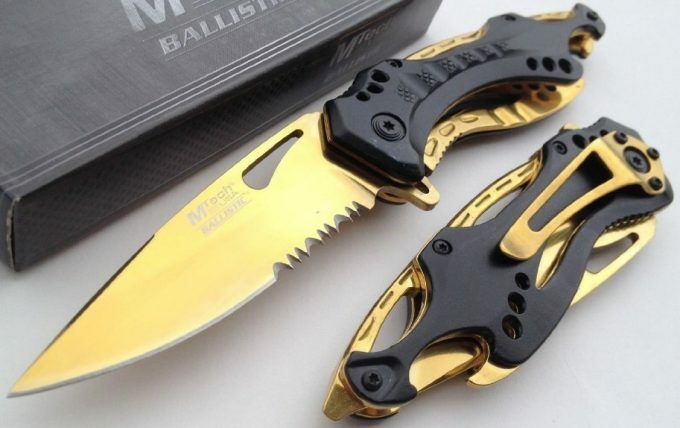 Furthermore, they also say that if you pair this pocket knife with a drill and drill bit set, you will truly feel like you can take on any job and get it done easily. All in all, a really useful knife that is actually considered as a multi tool, with a sharp knife’s blade that keeps the edge and becomes sharp as new every time you sharpen it. Related: If you think this is the right pocket knife for you, we recommend getting this sharpening tool Victorinox 43323 Pocket Knife Sharpener to keep your knife sharp like a blade. 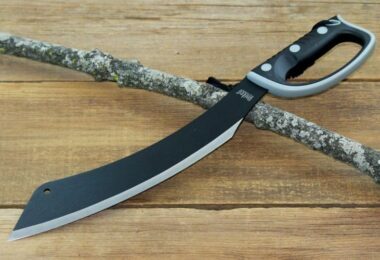 Specific features: AXIS mechanism; blade made of 154CM steel; manual opening action; spear point blade; thumb studs are ambidextrous style. 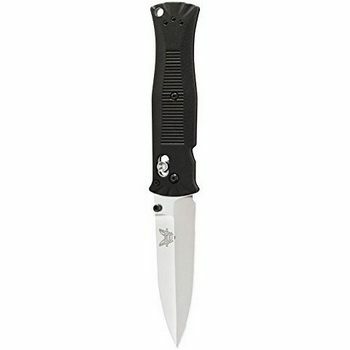 Description: The Benchmade 530 Folding Knife sports a price of around $100. The knife’s designer is Pardue. The knife light and features a blade made of 154CM steel. The stainless steel is made from Crucible Materials; A US-based company that has modified 440C stainless steel by adding molybdenum: Thus, you are getting a superior grade metal with the weapon you buy. The Benchmade 530 wields the outstanding blade to an equally exceptional G-10 handle featuring a textured surface for superb grip and comfort so that you don’t have to worry about blisters after long usage. The knife comes with a standard, reversible, tip-up clip so that you can carry it on your belt without worrying that it will hurt you or scratch your car seat, and a lanyard hole for ultimate convenience. The users who bought this knife claim that it is so light that you will forget that you have it in your pocket until the time comes to use it, but they also say that it is not actually designed for heavy-duty use so don’t expect to be able to cut metal or clear a forest with it. Related: This Winchester Winchester 43077 Pocket Sharpenercan be used to sharpen the blade of your knife. We recommend purchasing this pocket sharpener if you choose this pocket knife. 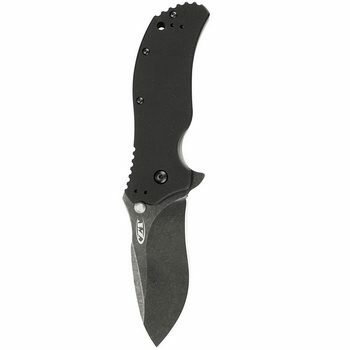 Specific features: SpeedSafe Assist Opening; thumb stud; a blade made of Sandvik 14C28N DLC coating, and a razor sharp edge. 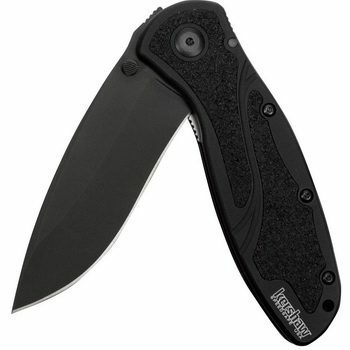 Description: The Kershaw 1670BLK Folding Knife sports a mid-range price of around $60. The knife has a SpeedSafe assisted opening so the knife opens easily and fluidly without struggle or risk of injury. The pressure on an included thumb stud is all it takes to open the weapon. The knife is fitted with an inset liner lock to prevent accidental openings. The blade is made of Sandvik 14C28N steel with a DLC coating for additional protection, and this blade is coupled with the 6061-T6 handle made of anodized aluminum and Trac-Tec inserts. The Sandvik 14C28N steel is one of the newest types of steel grades on the market, which has been optimized to improve corrosion resistance, high hardness, and edge performance. 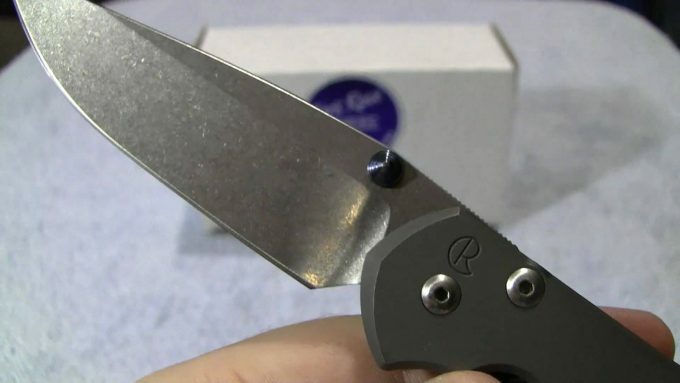 Users claim that you will get a razor sharp knife right out of the box and that no additional sharpening is necessary. Furthermore, they also claim that the blade pops out extremely fast and that grip has the perfect amount of traction. Related: We highly recommend this Smiths 50364 Sharpener & Outdoors Tool to sharpen your knife’s blade. Heading to the nearest sporting goods store or shopping online for one of the leading pocket knives for sale takes more than the sheer act of impulse buying. There is no getting around the need to give forethought to your purchase so you can get a knife that will work for whatever situation you find yourself in at the time. You will have to balance features with desire and not every knife will meet your needs 100% of the time: This is where compromise comes into play, and where you end up getting a knife with a few bells and whistles or you invest in a knife with more features than you can ever dream of using. Either way, when you find yourself in need of a quality knife, it will be nice to have one clipped to your belt or tucked away in a pocket just waiting to serve your needs; in fact, you might want more than one so you have different pocket knives for a variety of purposes. We hope that you liked our article and found it interesting and useful. If you want to share your thoughts with us and our readers, feel free to leave a comment in the comments section below. Thanks for reading!